I am suffering from an apparent truffle overdose. As the autumn truffle season approaches a crescendo, Florentines are in a frenzy to lay their hands on the best of the costly culinary crop. Merchants are raising the stakes for these highly coveted parasites as people hunt them down more furiously than did the original dogs and pigs. Even those of us who are reluctant to spend a small fortune on this addictive seductive fungus are giving in to the temptation. Including me. I’ve recently learned to simultaneously love and hate these brutally ugly creatures. In the past 10 days I‘ve engaged in the ultimate macho truffle challenge, having eaten ad nauseum this precious food in every conceivable culinary concoction…both black and white…accompanying tagliatelle and risotto, shaved on quail eggs (my favorite), mashed into a pâté, sliced on carpaccio, stuffed in ravioli, whipped inside a soufflé, sprinkled on paper-thin raw scallops and shaved on top of a mega Tuscan beef burger. I am up to my ears eating truffled pecorino, truffled sausage, truffled salami, chocolate truffles, and even truffle infused gelato. I was invited on a few recent occasions to dine at friends’ houses who needed to consume these potholed, grotesque looking creatures before they self destructed. They must be eaten immediately or they die an ugly death. After preparing my precious find with some friends in 3 different ways, I decidedly inhaled my last gluttonous truffle tasting for the year. It is now coming out of my ears, it is in my sweat, and somehow I cannot get the smell out of my apartment. 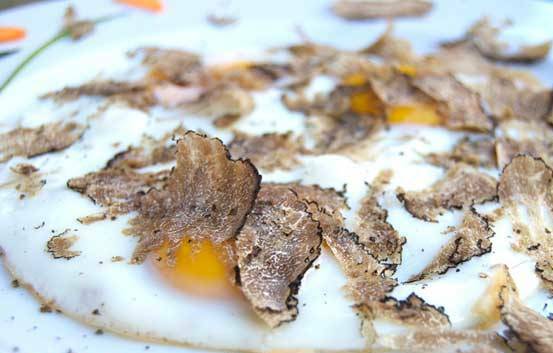 After preparing that pleasingly pungent microscopic morsel of white truffle that almost broke the bank, my whole house reeks of truffles. The exquisite aroma initially provoked an orgasmic olfactory experience on the first night, but even two days after its consumation, I nearly keeled over from the scent as I entered my apartment this evening. I opened all the windows, turned off the heat and prayed that the smell would vanish in time to prevent me from seeking revenge with a can of marsiglia-scented air freshener. Too much of a good thing is not good. Thank God truffle season comes only once a year. All the better to anticipate, to appreciate and to indulge.